Roses are symbolic with love and beauty – but did you know that roses actually have beauty and skin-enhancing benefits? This iconic flower can do wonders for your skin and complexion. 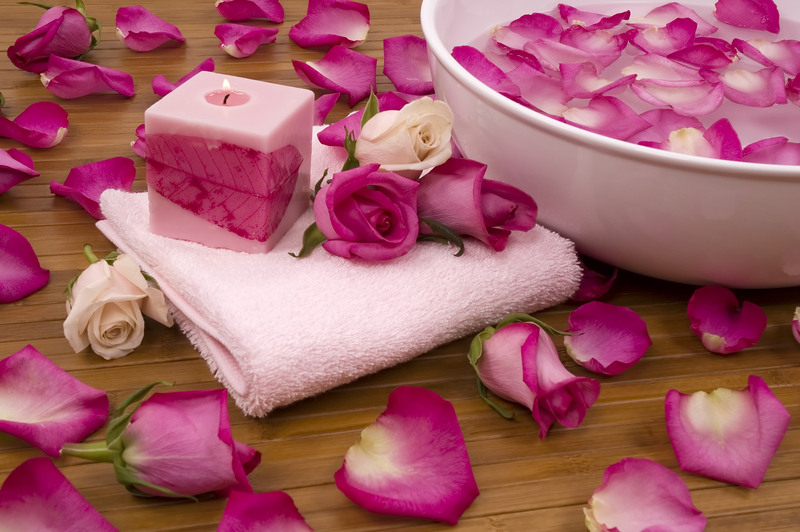 The ancient Greeks and Romans used rose petals to perfume their baths. Today, roses are used in many cosmetics and perfumes. Roses contain antibacterial, anti-fungal, and antiviral properties which make them beneficial to skin care and even health. There are many forms of the rose that can be used for beauty and skincare purposes. Rose water is known for its health and beauty benefits. Many use it in their baths for a luxurious experience, much like the ancient Greeks and Romans did. Rose essential oil is one of the most expensive essential oils. It takes several thousand rose petals to yield one ounce of rose essential oil. However, only a few drops are necessary to enjoy the benefits.The aroma of roses is said to be an effective mood enhancer. It it believed that it helps remove feelings of anxiety and promotes emotional well-being and helping one to feel more relaxed. Rose petals are often used in skin care and spa treatments. Antibacterial: Because rose essential oil is naturally antibacterial, it can be used to help treat acne and acne-prone skin. It is also used as an ingredient in many facial cleansers. Anti-Inflammatory: Rose oils can help reduce swollen spots or redness on the skin, because of this calming property it is used to treat rosecea and eczema. Antioxidants: Roses contain high amounts of vitamin C which is a powerful antioxidant. Vitamin C can help protect skin cells from damage. There is some evidence that rose water can help lessen the effects of sunburn. Moisturizing: Roses contain natural oils that can help lock moisture into the skin. Try mixing a small amount of rose water into your daily moisturizer. It is even a fantastic additive to hair conditioner! Naturally Fragrant: Already known for being fragrant, roses are often used to perfume many beauty products in lieu of artificial fragrances. Relaxing: There is evidence that the fragrance of roses can be calming and soothing to the mind. This doesn’t necessarily add beauty benefits, but many may argue that a calm mind leads to a happy body. Toning: Rose is a natural astringent that can help tighten the pores which can result in a more glowing complexion. You may wish to choose a rose astringent instead of an alcohol based one so the skin is not left feeling over dried. A bath of rose petals is a wonderful way to relax and treat your skin to a luxurious beauty experience! What you will need – 1 cup of rose petals, 1 1/2 cups whole milk, and fresh lavender if desired. There is no specific type of rose required for this. I would recommend using one with good-sized petals in a scent that is calming and pleasing to you. Pour a bath at a temperature that is comfortable to you. Avoid a very hot bath as it can dehydrate the skin. Drop the rose petals under the running water when the tub is about halfway full. Allow the water to disperse them and infuse the bath with its soothing properties. Pour the milk (and lavender if desired) under the running water. The milk will help to soften the skin. Enjoy the bath for as long as you desire. Gently pat – don’t rub – your skin dry when exiting the bath, this will help your skin retain some of the moisture. For best results, apply moisturizer to your skin immediately. Reap the benefits of your own rose garden! Enjoy beautiful roses in your yard and add them to your beauty and skincare routine! Start by browsing our roses. Annie, Thank you for sharing that article – it was very informative! We agree that the benefits of the rose are wonderful and more people should know about them! Thank you for reading and stay tuned for more blogs!